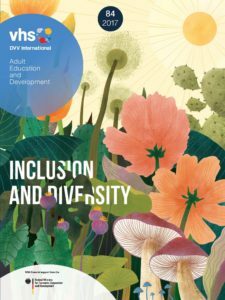 For example, Rima Abboud from Palestine writes about the experiences of the Aswat – Palestinian Gay Women network, and Annette Sprung from the University of Graz discusses to what extent the migration-related diversity in Austria is also reflected in adult education staff. Shermaine Barrett from Jamaica introduces the concept of “reflexivity”, which helps teachers to critically reflect on their own teaching practice and to make their teaching inclusive; and the Peruvian activist Tarcila Rivera Zea reports on her work in the Permanent Forum on Indigenous Affairs at the U.N. In a photoreportage, Mozambican photographer Mário Macilau tells the story of a learning project for people with and without disabilities in a village near Maputo. This entry was posted in News and tagged Virtual Seminar by Ricarda. Bookmark the permalink.